Weekend Kits Blog: New Baby Quilt Kits for Beginners! We have new kits for baby in the Quilt Kits section of the store. You won't want to miss our new selection of Cuddly Quilt Kits from Fabric Editions. Make a soft blanket for baby with these easy quilt kits for beginners! 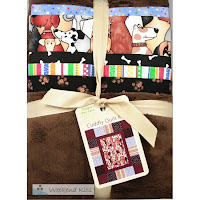 Cuddly Quilt Kits include coordinated solid and patterned fabrics, enough for both the quilt top and backing! Quilt kits take the guesswork out of fabric selection, saving you time searching for fabrics that match. 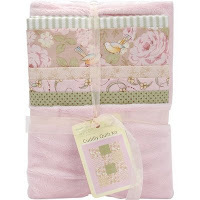 Cuddly quilt kits include a variety of fabric types, including textured plush, soft flannel, and quality cotton. Step-by-step instructions for making your baby quilt are provided. Choose from 8 new styles! The fun themes and colorful fabric selections are perfect for baby and young children of all ages. You'll find a variety of color choices, so it's easy to find the perfect quilt for baby's nursery. Beep Beep! is a classic collection of primary colors. Doggie Day Care features rich chocolate browns. Sweet Tweet is a vintage-inspired collection with dusty rose and sage green tones. Simple pieced patterns make these quilt kits ideal for beginners. They're also an easy baby quilt kit for experienced quilters. A quick weekend quilt project! Quilting is a rewarding craft to learn. The variety of quilt projects to choose from is endless - baby quilts, lap quilts, bed quilts, wall quilts, placemats, table runners, pillows, and more! Quilt Kits with pre-coordinated fabrics and simple quilt patterns make it easy for beginners to give quilting a try. You only need some basic Quilting Supplies and some instruction to get started. The Start Quilting with Alex Anderson is an excellent reference book for beginners to learn to quilt. Rotary cutting is an easy and accurate method for cutting your quilt fabric into strips and pieces. If you're new to rotary cutting and would like some on-line instruction, there's an excellent rotary cutting tutorial from The Purl Bee you won't want to miss. Molly's Sketchbook: A Rotary Cutting Tutorial explains the tools needed and provides step-by-step instructions. Helpful tips & techniques are included as well as plenty of great photos! 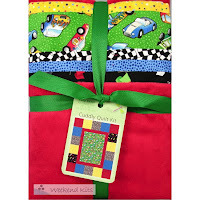 Make sure to visit the Quilt Kits section of the store to see all of our easy quilt kits. Weekend Kits offers a variety of creative craft kits for beginners and experienced crafters. Visit today and be ready to make a soft & cuddly quilt for baby on your next Weekend at Home!